RAW EDGES! This soft, vintage shirt has fashionable rolled arm cuffs and features a raw edge bottom hem. Add this trendy tee to your closet by creating or customizing your own design. The Bella Women's Flowy Muscle Tee with Rolled Cuffs is perfect for any occasion, but most importantly, comfortable! This product features a high-low back, where the back of the shirt is longer than the front side. Check out this new style and get hip with the latest trend. Hi low raw bottom hem. Who says you can't have both beauty and muscle? 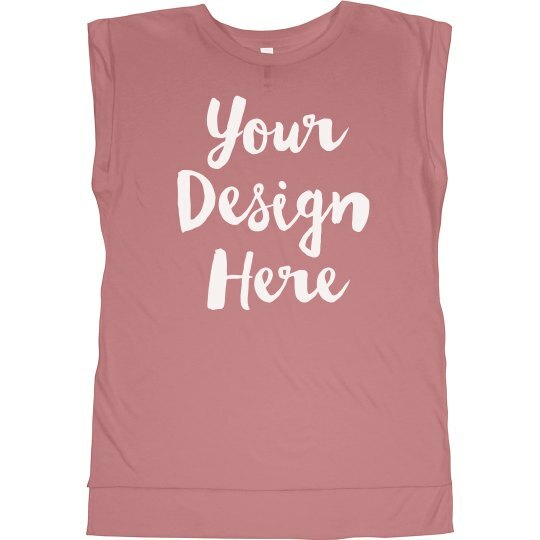 Work on building your muscles at the gym and show off your beauty in a customized muscle tank that is both sassy and athletic looking.